TONGUE TWISTERS are sentences that are difficult to say. They are good pronunciation practice. I originally created this page to give a good group of tongue twisters to people/students who want to work on getting rid of an accent, or to people who just like tongue twisters. Tongue twisters are a great way to practice and improve pronunciation and fluency. They can also help to improve accents by using alliteration, which is the repetition of one sound. They’re not just for kids, but are also used by actors, politicians, and public speakers who want to sound clear when speaking. Below, you will find some of the most popular English tongue twisters. Say them as quickly as you can. If you can master them, you will be a much more confident speaker. 1. 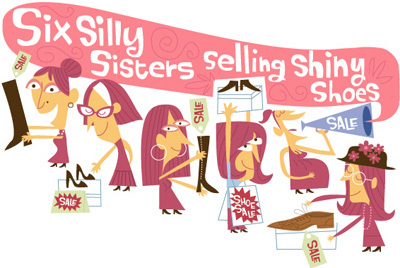 Six Silly Sisters Selling Shiny Shoes. 3. Are our oars oak? 5. What time does the wristwatch strap shop shut? 6. I have got a date at a quarter to eight; I’ll see you at the gate, so don’t be late. 7. Ed had edited it. 9. Nine nice night nurses nursing nicely. 10. Give papa a cup of proper coffee in a copper coffee cup. 11. The two-twenty-two train tore through the tunnel. 12. Which wristwatches are Swiss wristwatches? 13. A noisy noise annoys an oyster. 15. Flee from fog to fight flu fast! 16. Sam's shop stocks short spotted socks. 19. Two toads, totally tired. 20. Six thick thistle sticks. Six thick thistles stick. 21. Toy boat. Toy boat. Toy boat. 22. Six slippery snails, slid slowly seaward. 23. Red lorry, yellow lorry, red lorry, yellow lorry. 25. A box of biscuits, a batch of mixed biscuits. 26. We surely shall see the sun shine soon. 27. Six short slow shepherds. 28. Which witch wished which wicked wish? 29. Fred fed Ted bread and Ted fed Fred bread. 30. Peter Piper picked a peck of pickled peppers. 31. She sells sea shells by the sea shore. 35. I thought a thought. 37. The bear could not bear the boar. 39. Three grey geese in the green grass grazing. Grey were the geese and green was the grass. Tonton, Ton thé, t'a-t-il ôté ta toux? Étant sorti sans parapluie, il m'eût plus plu qu'il plût plus tôt.